In May 2007, I held my daughter Lorelei for the first time. My first day as a mother was an idyllic bubble of joy—Lorelei nursed confidently, I capably soothed her cries, and the nurses were a short call away should I have any questions about the many things I didn’t know how to do. On Lorelei’s second day in this world, my father came to visit. He came, of course, to say hello to Lorelei, to welcome her into this world and our family, to congratulate my husband and me. He sat holding his granddaughter, singing Ranger jodies into her tiny ears. He also came to say good-bye. He deployed for Iraq the next day. It’s hard for me to imagine how my heart held these two giant, opposing emotions. My blissful hours with Lorelei had an undercurrent of fear as my father bunkered into and worked from the Green Zone. I endured six months of this, of letter writing and baby bathing, of worrying and cooing. Six months brought me to winter, to the heartwarming and family-gathering holidays. One day around Thanksgiving, we found out that my father was coming home for a brief visit. Having lived abroad myself and having welcomed my father back from two noncombat peacekeeping missions, I was no stranger to homecomings. Yet nothing is so sweet as a homecoming from war. I hugged my father, saw with my own eyes that he was safe and healthy and doing okay. A blue-eyed baby Lorelei blinked her hello and smiled at her uniformed granddad. We wiped away tears as she sat in his lap and gummed his starry cap. Our fear was put on hold, and we relaxed into our conversation, dinner, and relief. 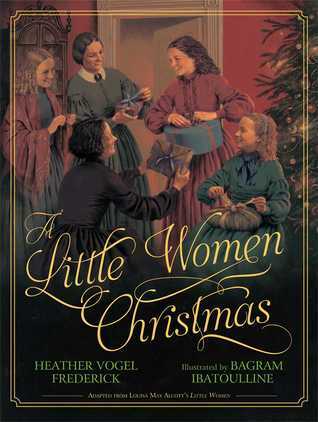 It is because of this experience that I was so moved by Little Women Christmas by Heather Vogel Frederick, illustrated by Bagram Ibatoulline (Simon & Schuster, 2014). In the book, a family full of women waits at home, with these big emotions of joy and fear and gratitude and relief tangled up among their ruffled skirts and thick petticoats. Looking at these women preparing for the holidays and hoping for a homecoming I once had, I needed some tissues. This picture book is an adaptation of the Christmas scene in Louisa May Alcott’s classic Little Women, a book actively loved by so many women, for such a long time. Heather Vogel Frederick does an excellent job of taking the wonderful descriptions and words and feelings from the novel and capturing the most important scenes, the most integral moments and putting them in this picture book. It serves as a fine introduction of Little Women from one generation of women to the next. The story begins with the “little women” preparing for Christmas. Jo, with hair cut short to support Father and the war efforts, builds a snowman with her current pal and future beau Laurie for weak but recovering Beth. Beth will see it from the window; she is not strong enough to go out and play. Marmee wraps presents and reminds the girls of how much they have, even though, compared to today, they have so little. And then, Laurie opens the door and we readers see Father in the shadow behind him, before his little women know he is home. Our hearts soar knowing what is about to happen, how his family is about to feel when they see what we see. And the homecoming—reach for the tissues, dear readers—is as sweet as it could be. Bagram Ibatoulline’s illustrations shine on every page with realistic details and rich emotion, but they are best on this page of homecoming. The little women reach for Father, needing to touch him to assure themselves that they are seeing him. He is, in fact, home. Homecomings are always sweet, but those involving a father returning from war to his women—this is something incredibly special. And for me, a daughter who lived through a similar experience, reading through this gorgeous book took me back to the holidays of 2005 when my father surprised us with a visit home from war. Better than that was in May 2008, just after Lorelei’s first birthday, when my father came home, safe and sound, for good. Kate Schwarz is a mom, wife, and writer living in Great Falls, VA. In addition to being a big reader to her three small children, Kate is a dog-walker, distance runner, Crossfitter, and blogger of raising kids with books at www.katesbookery.blogspot.com. How sweet. I’ve gotta have this on my coffee table this holiday season! I’m a sucker for homecomings. Pingback: Set sail for adventure , Archive » Thank you, Nerdy Book Club! What a sweet story you told about your baby girl and your dad. Oh, yeah, and also, you make me want to read A Little Women Christmas.